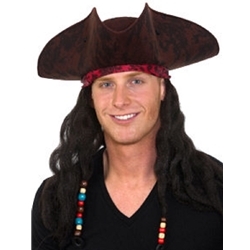 The Caribbean Pirate Hat with Hair is available in One Size Fits Most Adults. This Hat includes attached hair with beads woven in as pictured. The hat is a fantastic addition to a pirate Halloween costume, or for International Talk Like a Pirate Day, celebrated every September. Mix and match accessories from our array of pirate gear to create a custom look all your own!